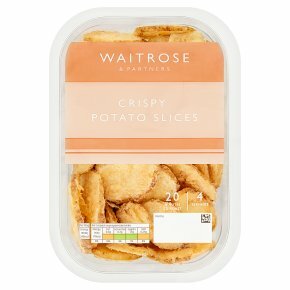 Golden coated crispy potato slices. Simply oven bake until crisp. INGREDIENTS: Potato (79%), rapeseed oil, water, wheat starch, fortified wheat flour (wheat flour, calcium carbonate, iron, niacin, thiamin), cornflour, free range dried egg white, salt, raising agent (disodium diphosphate, sodium bicarbonate).